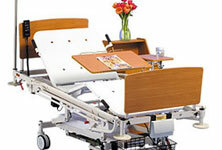 providing first class hospital beds around the world. Medicraft hospital beds are well known all across Australia for their high standards and innovation in the production of state of the art hospital beds and other hospital furniture. Since their acquisition in 2006, Medicraft has moved from strength to strength producing world-class hospital beds for the both the Australian and the worldwide market. Today the combined companies work to help healthcare professionals deliver effective and efficient care to patients in a safe manner whether they are in acute care, long-term care or home care environments. The company offers a wide variety of products and services across the sector of medical care including stretchers, communications equipment and of course Medicraft hospital beds. As well as sales and support services, the company also offers equipment rental with a substantial support infrastructure to compliment this service. With more than 6,000 employees worldwide and manufacturing, support and office facilities in a number of countries, quality healthcare equipment is within reach anywhere on the globe. Medicraft hospital beds are some of the most advanced in the world, offering features which ensure a safer and more efficient healthcare environment. Such hospital beds are easy to use with automated patient documentation, compatibility with various nurse call systems and a choice of wired or wireless connections. Furthermore, Medicraft hospital beds offer enhanced patient outcomes with a large number of clinical data points available including weight, head of bed angle and bed exit status, integrated surface data and a reduction in potential for charting errors and provision of clinical data for critical patients. Moreover, smart investment means that modern Medicraft hospital beds can be upgraded, they are EMR-connected and fulfil legal and healthcare requirements. Medicraft does not only offer smart beds but a whole range of beds for the use of intensive care units including specialist beds. Furthermore, Medicraft hospital beds offer a range of beds for maternal wards and surgeries and a wide range of other applications. Whatever the requirement there is a Medicraft hospital bed that can meet the specifications and expectations of the client. Not only do Medicraft offer hospital beds but a whole range of support infrastructure for the healthcare sector including furniture, IT solutions and many other support solutions. As a result, Medicraft can offer healthcare institutions a single solution for all of their healthcare and support infrastructure requirements to an exceptionally high standard. So when outfitting a new hospital, refurbishing or expanding an existing hospital or simply replacing existing or redundant equipment, choose Medicraft hospital beds for the best equipment available to the healthcare sector, years of combined experience in the healthcare field and the highest levels of international service and support that are available anywhere in the world.